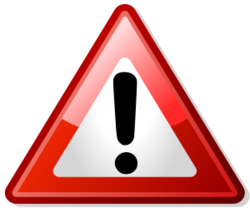 Please Be Aware of Non-Authentic 0 580 254 044 (BOSCH 044) Fuel Pumps! 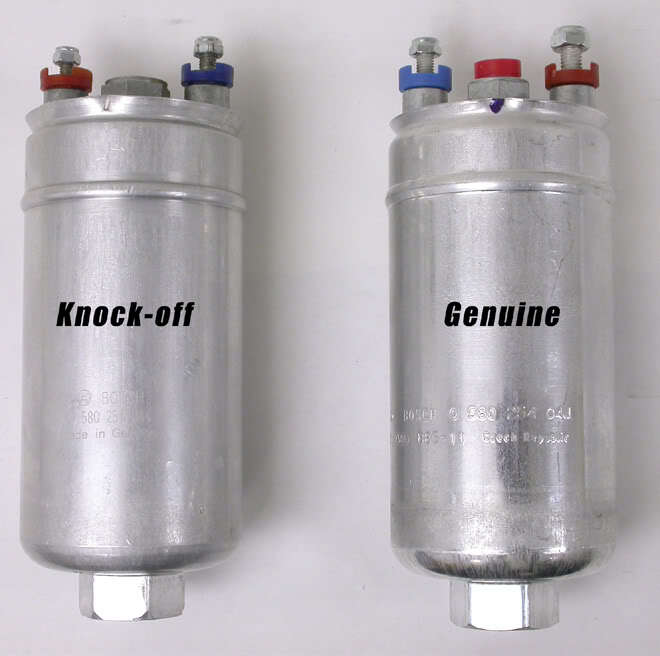 We've made this guide to help you identify fake 044 fuel pumps. 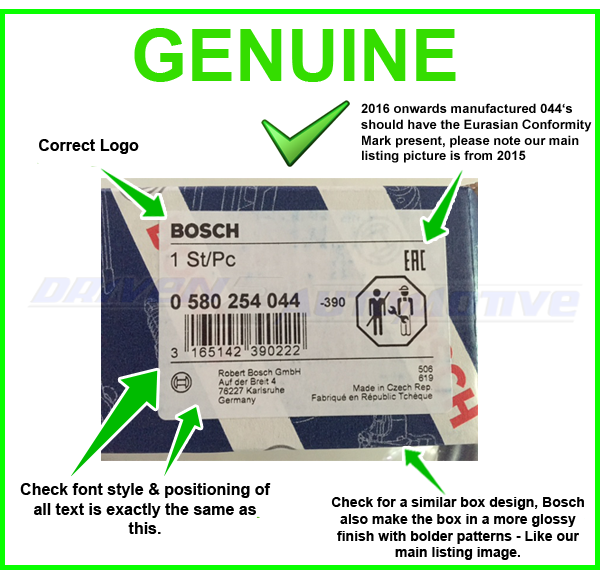 Recently there's been a large increase in counterfeit Bosch "0 580 254 044" more commonly known as "044" fuel pumps appearing on the market. 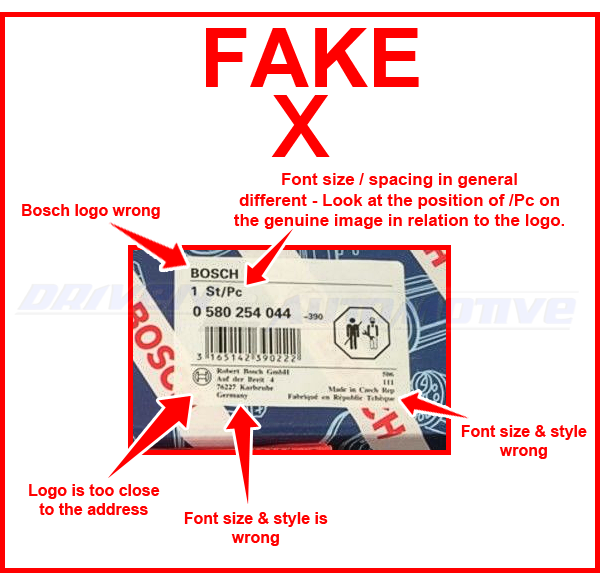 We know the products in question are non-genuine items as we've actually purchased some ourselves to put them side by side with the real ones so we can report them to Bosch, which we have. Please DO NOT BE FOOLED, even by laser etched stamps! The quick guide below points out some key areas on how to know which fuel pumps are fake. The box - Check the white label on the box for the EXACT match of the genuine 044 label below, if it's not the same then again its most likely to be fake! When we say "exact" we mean everything, font size, font style, text spacing and barcode number size. Yellow box with a far eastern style font - Look at the box, you shouldn't have a yellow Bosch box product anymore as Bosch changed the design to a blue box some time ago. Look at the text on the white label on the box. If it's like the one below, it's fake. 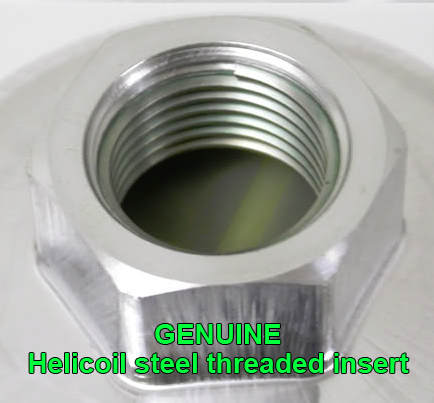 M18 Inlet - Check for an M18 threaded "helicoil" type steel insert. 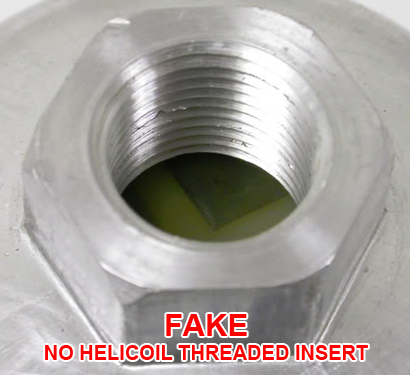 If no threaded insert is present it's fake! Also the inlet size can be smaller. Inlet filter - The plastic cross on the filter that you can see looking through the inlet can be a different design also. Pump sealed bag - Not many people notice this one, Inside the genuine Bosch box you should find the pump sealed in a plastic bag which is NOT vacuum sealed, therefore the plastic should be loose around the pump. The genuine plastic bag also has the Bosch "magneto" logo and some text along the seal join where its been imprinted by a Bosch press. The fake pumps tend to be vacuum sealed, which means all the air has been sucked out and then sealed to save on packaging size, but we have also seen them not vacuum sealed, so beware. Pump body - Fake pumps can have a much more dull appearance to a real 044, in the sense that the genuine item is slightly more polished looking. Price - If the unit price is too good to be true - It should ring alarm bells. You cannot purchase the GENUINE unit for less than what we offer. The counterfeit items in our experience are generally sold in the £50 - £100 range. Outlet - Another key area, check your pump is exactly the same as the genuine one below, notice how the inside of the outlet is different. Wiring kit - As a gesture of goodwill, we include a free wiring kit that we also sell with our own DA-31 fuel pump. However BOSCH does not ever supply such a wiring kit with this pump! Therefore it's another key area to look for. Flow rate - This is a key area which fake pumps will never be able to hide from, it is difficult to know what is right from wrong unless you have experience with the genuine item. Unfortunately this still goes on today, of course by pointing out the many issues with fake units, it gives the opportunity for counterfeits to be revised, however in the upcoming months major updates are arriving so these pumps cannot be copied anymore. DO NOT BE FOOLED! If in doubt you can always contact us and we will give an honest opinion, if you want to go all the way we can get the pump fully flow tested for you. 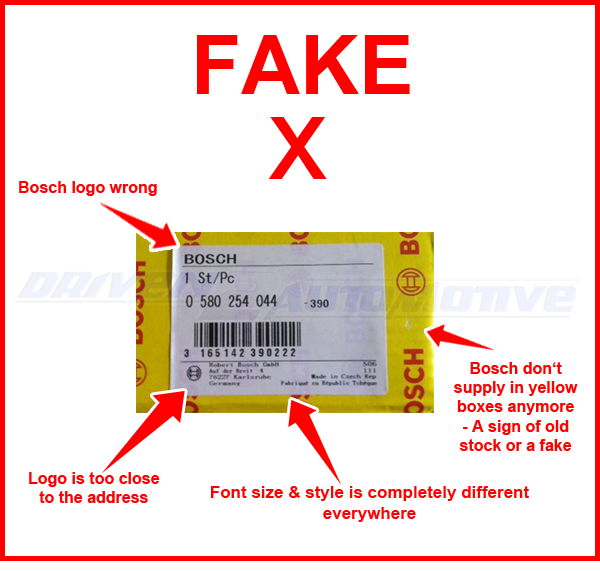 We bring this information to your attention because we don't want you to think you actually have a genuine Bosch product on your pride and joy when you have actually have something of terrible quality. You have to spend good money for your application, do not cut corners on the fuelling / fuel system.